A sense of community is really important for any course, even if it's taught exclusively online. What are some ways to create a community in your online course? Anything that engages with your students and gets them involved can be a benefit. You can showcase successful students, set challenges, bring in guest speakers, and much more which we'll discuss below in this article. Just because your course is online doesn't mean you don't need to create a community. Having some form of community is almost expected for online classes nowadays. In fact, there are plenty of online course platforms that offer all the features you'll need to create a thriving online community of your own. Some instructors may neglect the community aspect of their courses since they aren't seeing and interacting with their students on a regular basis. But a community can be a crucial part of building a successful online learning program. Students need the support and motivation that a community can help provide. In this article I'll discuss why creating a community for your online course is important and several ideas for how to go about establishing and growing your course community. When you think of someone taking an online course, you probably imagine someone sitting at home on their couch or in a coffee shop with their laptop. Online learning can be a lonely experience for many students. It's just you and your computer, with headphones on, working through the course material. You have no idea what experiences your peers are having with the course or what kind of struggles they may be going through. You don't have any feedback as to how you're progressing. Having a sense of community for an online course isn't just a nice bonus feature to include. You should view it as something that plays an integral role in your student's learning experience and their overall success. Creating a relationship with a student's peers makes them more comfortable when it comes to asking questions, speaking up, or voicing their opinion. Studies have shown that they're also just more likely to be successful with the course overall (source), and a community also increases student satisfaction. So we know that feeling like you're part of a community is an important part of the learning process. But how do we apply that to online courses? Learning online has its benefits, but it also presents some unique challenges. One of those is trying to create a group for your students to feel a part of. But students don't sacrifice a strong community just because they are choosing to learn online. 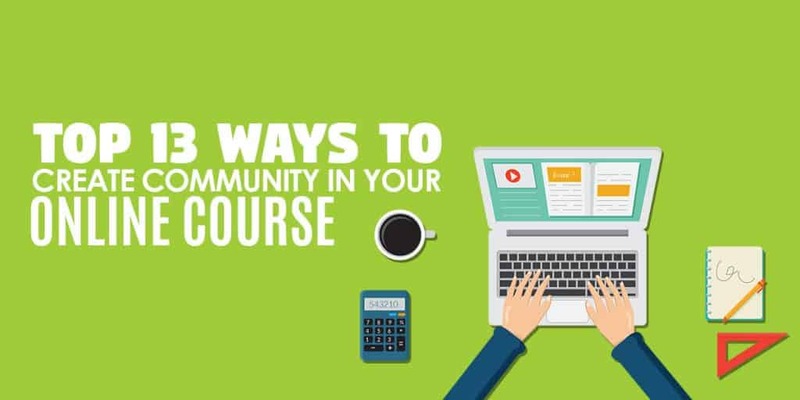 Here are a few ways that you can create and boost a sense of community in your own online courses. As an instructor, you should be present within the course community. In a traditional classroom, an instructor can interact with students and build a sense of community with all members at once. They can openly talk about the course and answer questions, as well as just chat casually to create a bond with their students. The same is true of online courses. There's no reason you can't give online students the same sort of community experience they'd get from attending a class in person. An important part of making your online community is to set clear expectations at the beginning. Let students know which hours you'll be online to chat if your course has a chatroom. Let them know approximately how long to expect a reply to an email, or how much you participate in the course discussion board. It might depend on the type of course you're teaching. Sometimes you might want to just set aside a few hours each week to answer questions, while other courses it might make sense to provide a little bit of support and answer questions daily. An online community can't just be a one-way thing where you're the only person posting. You'll need to get students involved as well to create a real community. Conversations arise more naturally in a physical classroom, just because of the nature of it. People love to chat and get to know their fellow classmates while waiting for the course to begin. In an online course environment, you need to be a bit more deliberate about creating communication between students, as well as getting them to communicate with you as the instructor. Group projects and student presentations are often used in a classroom setting, but they aren't very practical in an online course. There are a few things you can try to spark some communication among students though. At the start of your course, it's a great idea to encourage students to share an introduction with the group so that everyone can get to know each other. Plus it gives you some insight into the kind of people in your course and helps you tailor responses to meet their needs. Don't forget to introduce yourself as the instructor as well and share a fun fact or two so you can get the ball rolling. It's great to encourage your students to share information about their pets, friends, family as well as professional experiences. You might even encourage people to post pictures of short videos of themselves, because it's always helpful to be able to put a face with a username. Encourage students to use a general forum or group message board to ask any questions they have about the course, as well as just to bond with other students. It doesn't matter what kind of course you have, it helps to show off successful students. If you've got a course about playing guitar, showcase a video of a student's awesome progress from day one of playing to a month later. If you've got a course about business or entrepreneurship, show screenshots from students to share how much money they've made so far. For a photography course, encourage your students to regularly share their favorite photos they've taken. In all of these cases, showcasing successful students will give your brightest students a boost of confidence and it will also motivate all of your other students once they see what is possible. Showcasing students can also double as a promotional tool. You can use it as proof that your course works on your sales page. The best kind of testimonial is showing off the real-world results that your course has provided for students! Students need a strong reason to continue working their way through the course. Especially if they're doing your course on top of a full-time job or other commitments. Having a strong “why” will give your students the motivation to keep pushing through the course and reaching for their dreams, even when things get tough. Showcasing members is one way to do it, but you can also use motivational quotes or whatever other strategies you think will work. Get your students to ask themselves how they would feel if their course goals were accomplished and all the great things that will come out of it. Challenges can give another whole level of motivation to your students. You need to find the right balance between assigning tasks to your students that pushes them to work hard and get outside of their comfort zone, but without making it so difficult that they get demotivated or have a high chance of failing. In a photography course, you might ask students to take a certain number of photos this week. In a writing course, you might ask them to write the first 5,000 words of their novel. Make your challenges something that will provide a tangible benefit and get your students moving along their journey to mastering the subject at hand. Something as simple as badges for certain achievements in the course or a bar that tracks your student's progress can make them feel like part of a community. It also helps distinguish the students that have worked further through the course and might be more qualified to answer questions on your course message board. Students with a badge or special title next to their name might naturally start to gravitate toward more of a mentor role for newer students. This creates a sense of community for both them and the new students, as well as making your workload easier when it comes to answering questions. A great way to spice things up a bit in your course is to bring in special guest speakers. You might just get someone different to record some of your course videos, just so that it isn't always the same face and voice that your students are listening to. You can invite experts in the field to participate in your discussion forums, do a live video question and answer session, or find some other way to fit them into the course. You can also do podcasts and other collaborations with guests and other content creators. This can be mutually beneficial to both of you. You get great content for your course, and your guest gets some exposure to new potential students, followers, and clients of their own. Getting feedback is an excellent way to interact with your students. It can be as simple as a forum post or a message to your email list asking for suggestions, or even just a general question like asking how the course is going so far. You can post these intermittently manually, or even set up scheduled emails with an autoresponder so that students automatically get a follow-up message after they've been in the course for a couple of weeks. Not only will your students feel more engaged, but you'd be surprised how much taking feedback from students can help improve your course. I'd start doing this early on to create a better learning experience for future generations of students that take the course. Make a variety of posts on your course discussion board that invite responses, discussion, and questions. Be sure not to post questions that can be answered with a simple yes or no. Make questions open-ended to encourage ongoing suggestions and opinions. Make sure to answer your email and check your discussion board on a fairly regular basis. I'd suggest at least four times each week. Nobody wants to post their heart out to a community of strangers only to be told that their idea is stupid. So you should set some basic rules or “netiquette” and have a moderation system in place to enforce them. Whenever you get a group of people together, you're sure to get a variety of different opinions. Especially when you're communicating online with some sense of anonymity. Differences of opinion are fine, but as an instructor it's your job to make sure they don't turn into arguments or become mean-spirited personal attacks. Make it clear when your students sign up for the course on how they're expected to act, and what behaviors won't be tolerated. Including how to resolve conflicts in the community, and that they should respect other people's opinions and thoughts and avoid comments that might be seen as insulting. Also be sure to clearly lay out how students that violate the rules will be handled, and that offensive behavior will have repercussions, including a ban from the community if things get too out of hand. Since so much of online courses is reading on your own and can feel isolating, having some live events can really liven things up. This can be as simple as holding a Q&A live stream for your members once a month where they can ask any questions they've got about the course. Depending on how spread apart your students are, you might even consider holding a real-life meetup once or twice a year for everyone to get together and meet in person. Your events don't necessarily even need to be directly related to the course. Maybe you'll hold an online book club or general live streams to draw in other people from your niche and make them aware of your course. The more people you connect with, the better of a position you're in to continue building your following and community. Anything that gets students away from just reading PDF documents and watching pre-recorded video is a good way to boost the sense of community in your course. Holding live streams to the public can be a great way to establish yourself as a subject matter expert in your field and get people familiar with you as a trusted resource. Plus your live events can be repurposed into videos and other types of resources for the course after the fact. Just like asking for feedback from your students is an important part of your online community, so is providing feedback to students in return. Get your students to provide examples of their work from tasks you assign, and then give them constructive feedback on some areas where they might improve. Be sure to include lots of positive comments about the areas they excel at to balance out any criticism you provide. You need to sandwich any negative comments between positive feedback so that students won't leave feeling discouraged or like they aren't performing well enough. If you're creating online content and trying to build up a community of followers, then being active on social media is almost a must nowadays. You don't have to be active on every social media platform. Actually it's best to try and focus on just two or three main ones that would work well for your niche. Some content naturally lends itself better to visual platforms like Instagram, while Youtube or Facebook might be better for others. You should be regularly sharing content, at least a couple of times per week. As well as connecting with people and answering questions. But don't get too sidetracked and let social media take up hours of your week either. A few images with inspirational quotes or tweets with updates on what you've been doing are usually enough, as well as some time set aside to respond to comments and private messages. The bottom line is to pick platforms that you're comfortable with, those that work well for your niche, and where your potential students hang out online. Setting expectations for your course early can be a big help in the long run. Before your course is even complete, you should have a basic idea of what kind of interactions students should expect. Part of your sales page for your course should outline what kind of community interaction the course entails and how much one on one contact they should expect to have with you as the instructor. For example, you might set a standard that you respond to any question within 24 hours on weekdays, and you'll hold live chats for 2 hours every Sunday night. Encourage students to ask their questions on a public discussion board where possible, instead of contacting you directly for advice. That way you can answer a question once and people can view it, instead of having to answer the same basic questions over and over. More experienced students will also be able to answer questions themselves to lighten some of your workload. I'd really recommend encouraging your students to use the search feature on your discussion board before asking a question as well. After a few months, it should be pretty rare that someone is coming up with a unique question that nobody else has asked before. We've seen just how important it is to have a sense of community inside online courses to keep students engaged and having a relationship with their peers to increase their learning. We've also looked at 13 great ways to build community in your courses and if you pick up and follow just a handful of these you'll be on your way t o creating a strong bond with and among your students. Just be clear on how much time you'll be devoting to the course community on a weekly basis so that students have reasonable expectations, and if you can't put the time in yourself then enlist some key members from within your community to make it happen instead. The reward for students and for you in terms of satisfaction, feedback, testimonials, and success stories will be more than worth it.